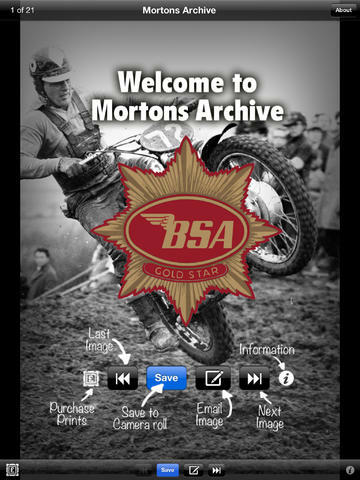 Goldie Archive is a collection of 20 stunning archive images of the classic BSA Gold Star motorcycle. Each image has been optimised for the retina display of the iPad, iPhone and iPod touch. Pictures can be emailed to your friends directly from the application, or saved to the camera roll to be used as wallpaper. The greatest all-round motorcycle in the world? In the opinion of many, that’s the BSA Gold Star. Whether on the road, the racetrack, in motocross or trials, BSA’s ‘Goldie’ excelled at them all. 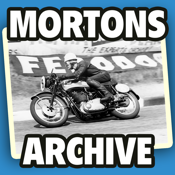 It was the fastest, the toughest and, to many eyes, the best looking motorcycle of not only its own generation, but of all. This set of 20 images captures the style and wonder of the Gold Star – a motorcycle which outperformed the sum of its parts and which still, today, has the ability to stop people in their tracks. From its earliest incarnation before the Second World War, to the last in the early 1960s, each era of ‘Goldie’ is presented with a stunning, striking period image.